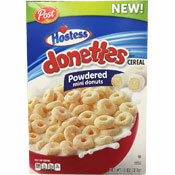 33 cereals start with the letter "D"
The complete name of this cereal is Hostess Donettes. It's described on the front of the box as "powdered mini donuts." More Cereals That Start with "D"